The world is growing taller as the iconic 1km high Kingdom Tower project, in Jeddah, Saudi Arabia takes shape. The Kingdom Tower will stand at 3280ft (1km) high, which is around 3½ times the height of The Shard in London. The Burj Khalifa, in Dubai, will lose its title as the world's tallest building, as the Kingdom Tower overtakes it by 570ft (173m). 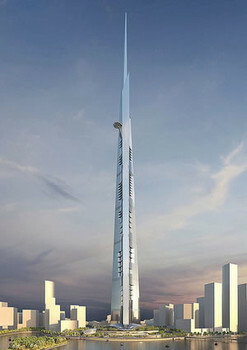 The Kingdom Tower will be the equivalent to the height of 1514 Armorgard TuffBank TB2! The £780m Kingdom Tower will be a mixed-use building, spread over more than 200 floors. It will house a five star luxury hotel, apartments, office space and will boast the highest observation deck in the world, situated on the 157th floor! Construction work is scheduled to start in the middle of 2013, and it is due for completion within 63 months. Mace, the London based company will participate in a joint venture with fellow British company EC Harris, to manage the Kingdom Tower development. Construction is in full swing on the brand new 14 floor South Glasgow hospital. The total cost of the new build hospital is in the region of £842 million, and is set to open its doors in. London Bridge Quarter is a new commercial district in one of London’s most significant transport interchanges. The two most visible landmarks will be The Shard and The Place. The Place will.